Here in the North East the weather seems hellbent on reminding us that its still winter… so when a job posting like this comes across our desks we feel obligated to share the warmth far and wide. Most rural communities can trace their origin to some sort of food production. As industries come and go and we find ourselves headed back to the soil – to towns and villages that have been watching the population migrate in the opposite direction – we are reminded that food production can/is/will always be a vital part resilient communities. And now a wonderful opportunity in Huntly, Scotland. Deveron Projects is an arts organisation based in the rural market town of Huntly, Scotland. Through creative critical work we aim to contribute to the social wellbeing of the town, connecting artists, communities and places. Deveron Projects has no building, instead the town is the venue; acting as studio, gallery and stage for artists of all disciplines invited from around the world to live and work here. Through artist driven projects we explore, map, inhabit and activate new spaces and places around Huntly. We believe artists are cultural activists that can energise people and communities, adding vitality to our society. By utilising creative and playful processes art can be employed to untangle and overcome real-life challenges, invent and enact alternative possibilities, and help solve problems. 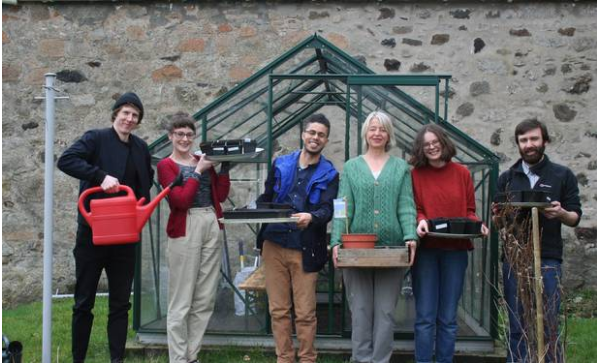 The Town is the Garden is a one-year creative horticultural programme aimed at improving Huntly’s potential to grow more of its own food and create a more sustainable local food economy. Through employing a Gardener in Residence we hope to develop Huntly into a garden town that celebrates locally grown produce. It’s an ambitious project, but we’re certain there are some well callused greenhorns out there looking to dig into something like this.